So, pork. When done right, it’s tender, juicy, and packed with flavour. It pairs well with a lot of different things, which makes it a versatile and whimsical meat. Sometimes though, too much of a good thing is a very, very bad thing. If you’re morbidly curious, here’s how I did it. Plate up: quenelles for ice cream, swirls for black tea and chocolate sauce, add a touch of granita in the big yin-yang spots. Slice and arrange the pork, sprinkle over hazelnuts, and take a photo. Realise you’ve forgotten the scallops, but by the time you decide how you want to arrange them on the plate, the ice cream has melted more and you can’t be bothered taking a photo of the actual finished product anyway. Freshly crack pepper. Eat and try to keep it down. Enjoy! Be warned: if you try this at home, do so at your own risk. 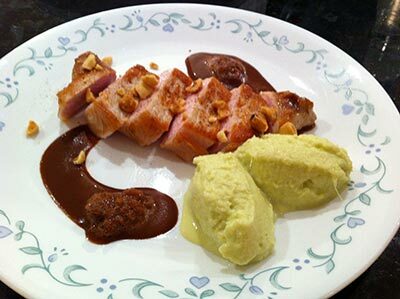 This entry was posted in food and tagged pork, recipe, seafood. Bookmark the permalink.